Roggenrola in game: 12,465 Who? Important notice! Pokemon Roggenrola is a fictional character of humans. Roggenrola (Japanese: ???? Dangoro) is a Rock-type Pokémon introduced in Generation V.
It evolves into Boldore starting at level 25, which evolves into Gigalith when traded. Roggenrola is a roughly spherical Pokémon discovered a century ago in an earthquake fissure. Its body is blue and covered in large, smooth facets. It has a hexagonal, yellow artifice in the center of its body, leading to a hexagonal opening that functions as an ear. Roggenrola has a brown, rocky oblong atop its head, and similar brown rocks that serve as feet. Its body houses an energy core; due to compression underground, both this core and Roggenrola's body are as hard as steel. As stated by Cilan in Where Did You Go, Audino?, Roggenrola has sensitive hearing and can hear sounds that are inaudible to humans. It tends to follow the sounds it picks up with its lone ear. Roggenrola first appeared in Gotta Catch A Roggenrola!, when it fell into Cilan's food and beat Ash's Tepig and Oshawott in battle before being abandoned. Ash and his friends found it later in a cave where it was captured by Team Rocket. They free it and help it rescue the other Roggenrola. They're all then healed at the Pokémon Center, and the Roggenrola that they met before has a rematch with Ash's Tepig and is captured by Ash. It later evolved into a Boldore in Battling the King of the Mines!. 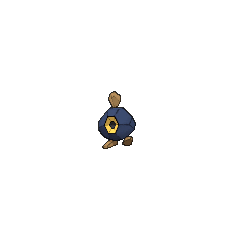 A Roggenrola appeared in The Path That Leads to Goodbye! in a flashback. Multiple Roggenrola appeared in A Pokémon of a Different Color!. A Roggenrola appeared in Go, Go Gogoat!. Four Trainers' Roggenrola appeared in SM006. A Roggenrola appeared in SM008. BW034 Roggenrola Ash's Pokédex Roggenrola, the Mantle Pokémon. Roggenrola's body contains an energy core which is hard as steel from being compressed underground. In The Key to Triple Battles, Monta uses a Roggenrola against Cheren in a Triple Battle. Its Sturdy Ability allowed it to withstand Monta's Panpour's Surf, which allowed it to attack with Rock Slide, which took out Cheren's Pansage and Basculin. A Hiker named Andy uses a Roggenrola during his Triple Battle with Black. However, it was defeated after Andy became dehydrated. Born deep within the ground, it compares itself with similar species, such as Geodude and Carbink, to settle which has the hardest body. Moves marked with a superscript game abbreviation can only be bred onto Roggenrola in that game. It's hard to understand what he is saying, but you try your best to understand him. That is a friendship. For other sprites and images, please see Roggenrola images on the Bulbagarden Archives. Roggenrola is similar to Geodude: Both are Rock-type, have Sturdy as one their Abilities, evolve at level 25 and reach their final forms when traded. 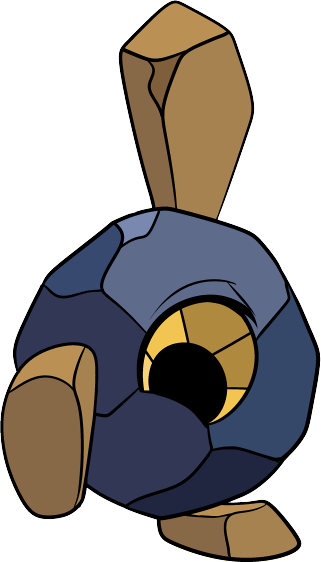 Roggenrola has the lowest Special Defense base stat and also the lowest base stat total of all Rock-type Pokémon. Roggenrola is mentioned in X, on television, as being used as a ball in a version of bowling. Also, there is a chance of explosion, depending on the Roggenrola. 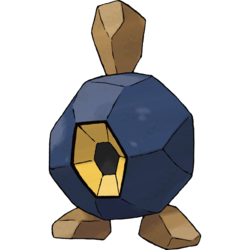 Roggenrola is based on a geode. Roggenrola is a corruption of rock and roll. It may, more specifically, be based on the pronunciation of "rock-'n'-roller" (a slang term for musicians who play rock and roll) in certain dialects of American English. Dangoro may be a combination of ?? dango (a Japanese dumpling) and ?? goro (grounder). It may also derive from ???? goro goro (onomatopoeia for the sound of a boulder rolling). Japanese ???? Dangoro From ?? dango and ?? goro. May also derive from ???? goro goro. Korean ?? Dangul From ?? Dango and ???? deguldegul. May contain ? gul, a place where it can be found. Mandarin Chinese ??? Shíwánzi Literally "Stone ball".